Oh man. 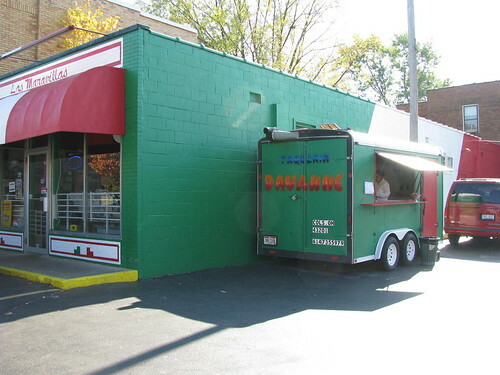 OK, so this was our first taco truck. We bought a house on Forsythe two years ago and we used to always go to this truck until they stopped serving. In the meantime, however, Junior’s moved in across the street and we’ve since fallen in love with Carlos, his family, and their amazing food. We’ll just have eat twice as many tacos! We fully approve of the doubling of taco consumption. As Taco Jane would say – true that! Juniors for Dinner and Davanne for second dinner. La duena told me they are going to do tamales at the weekend. Judging from the tacos and tortas I had yesterday, I’d guess their tamales will be delicious. Went there today for lunch with the Taco Truck Thursday crew from OSU; it was muy bueno. The el pastor was delicious, the folks were nice, and there was a great selection of drinks in the store next door. The menu is limited, but expanding to meet demand. Highly reccomended. Just got back from taqueria davanne: WAY KILLER! The chorizo and the al pastor were both killer, though it being my first time eating al pastor I might not be in the best position to judge. Their red sauce is an absolute yes if your into hot and smokey flavors. We just got tacos but I think I might be back tomorrow for more! Anyone have any experience with their Chile Rellenos? Tried the green tamales today-excellent!! The couple operating it (he from Morelos and she from Jalisco) were really nice and gave lots of travel advice for visiting their respective locales! I will definitely be going back (maybe again this weekend) to try the red tamales. Day three of my personal Taco Truck tour… Lunch at Taqueria Davanne. Carne Asada Burrito and Carne Asada and Al Pastor tacos… Pastor was slightly sweet and barbequey with sauteed onions as well as cilantro and diced onions. Asada tacos were very good, but slightly dry, though this was remedied with prodigious applications of salsa. The Burrito was wonderful with a beautiful balance of meat, beans, avocado, lettuce and sour cream. As the office is close to this location I will definitely be back regularly! I’m glad this truck was reviewed – based on the positive feedback, I went there for dinner last night. The carne asada tacos were great! I will be back! I popped by there today. I have to say that the tacos were okay–I had carne asada and chorizo–but nothing to write home about; if I’m going to get tacos, I’d much rather go to Taco Nazo for carnitas tacos. The tamales, which I was really excited about, were not good today. They had a really high dough-to-filling ratio (not much filling at ALL)… and they had a weird aftertaste, almost like… like these sticker books I used to get when I was a kid, and you had to lick the back of the sticker to apply it. Kind of that minty, adhesive flavor. Going to try Junior’s next time. Stopped by today with some friends. Tried all of their tacos and their tamales and was very pleased. So much so that I bought their chorizo in the market. My friends had the burritos and loved them. Will be making this frequent stop. Being from Az. and having spent most of my life eating “real” Mexican food, this was a welcome site. Tired of all the authentic Mexican places that are only authentically American Mexican food. This fat chica is one happy camper! have you tried cuco’s on henderson?? The torta con chorizo is incredible. I ventured out late this morning in a blizzard for one of these perfect treats. That is a very tempting idea! It is well worth braving the elements. Put me squarely in the Taqueria Davanne camp. I’ve been coming here for a couple weeks now and never had a bad taco. Nothing I’ve had here has been really exceptional, but everything’s been quite good. Carne Asada Taco – very good. Pastor Taco – very good, but not as good as most people rant about Pastor. Kinda disappointing. Chile Relano – a big soggy, but taste was above average. If I went back again, I’d try the chorizo. Just talked to the owner who says that he will be making goat a regular special on Saturdays (he also has been doing a regular deep fried half chicken which is very good. The canned refried beans that accompany–not so much.) He says that he steams the goat for 7 hours. Never had a goat taco before. Definitely will be checking it out. Also, this week he had a special salsa made with peanuts–a specialty of the region he came from in Mexico. Truly outstanding. He should bottle it. Ate here today and loved it. Had the three taco plate with rice and beans, one carne asada taco, one al pastor taco, and one chorizo taco. Everything was delicious! I have so far only eaten here and Junior’s and liked them both. Tried their carne asada tacos today. Compared to my regulars, Junior’s and Taco Nazo, they seemed rather skimpy and not as flavorful. This is my second time trying them, same opinion. On the plus side, I really, really like their rellenos–just awesome! The husband/wife owners are a delight, too. Tried the goat and it was GREAT! Also: this guy really knows how to cook lengua, and has it often. I have to say the lengua here is WAY better than Junior’s. Finally, you have to ask but they have awesome habenero sauce (really hot). The pollo tacos with the chile de arbol sauce were awesome. Great location next to the Mexican market (for drinks or cervezas..). Love the authentic Mexican vibe and the couple who run it are very friendly. Finally tried the barbacoa de chivo (goat), the regular Saturday special. As noted above, really great. Very tender and juicy. Amazing with onions, cilantro, and the habanero salsa. I’ve hit 95% of the taco trucks listed here over the last 2 years. We know that there are probably five top trucks that can be relied upon to please virtually every time. For me, Taqueria Davanne is at the very top. Nothing else quite rises to the same level. The cerviche tostada, the lungua tacos and most of all, the other-worldly chivo tacos (Fri and Sat only) are nonpareil. The husband and wife running this cart are also among the most friendly, always a nice extra. When and if you have the fortune to arrive early on Fri or Sat, be sure to ask for a cup of the consomme made from the steamed goat drippings along with tomoto, rice, and chickpeas to go along with the luscious tacos de chivo. Though I don’t have the taco truck hit rate that FredSS above has, I agree that this is my favorite. I get a Davanne platter one or twice a week Mon-Thurs (usually the chorizo, lengua and either carne asada or polo) and the barbacoa de chivo is a highlight of my weekend. Even my 14 year old daughter, who was a little skeptical about eating food from a truck, looks forward to her weekly platter. Also a big fan of their tamales (both green and red). They recently added a shrimp dish, though I haven’t tried it yet. My daughter moved away from Columbus 6-7 years ago, so missed the food truck explosion in Columbus. Home from California for the holidays, I was eager to take her to Davanne the Tuesday before Christmas. With a critical mass of hungry potential clients gone for the break, they did not have the usual lengua special, but had the even more special carnitas for the first time and they were great. The meat was flavorful and had a nice mixture of crispy and moist meat. Tamales, pollo, chorizo, cecina, and carnitas all around. Four adults and one teen were very pleased. We tried to go again the Monday after (having already sneaked in a Rayray’s BBQ pit Christmas eve dinner), but they were closed so had to go to Junior’s. This is the second time I’ve been there and I was not so impressed the first time around. I decided to do a one to one comparison with Davanne, so went with the polo and carnitas. For me, Davanne is the clear winner. I find that their tacos are much more flavorful. The chicken at Juniors was somewhat bland (though did have a nice hint of citrus – though that could have been the lime) and the meat was presented in pale chunks as opposed to the spiced and shredded meat at Davanne. The carnitas at Juniors offered none of that nice crisp meat and was greasy. The tamales were fairly comparable but, again, Davanne just had more flavor. Here’s hoping Davanne makes the carnitas a regular special. Sadly, Davane is closing after this week. They are open with a limited menu through the rest of this week, then they will close. The proprieter says they will probably not reopen. Sadly, Davane will close after this week. They will be open through this week with a limited menu (compared to the usual rather extensive menu) and then they will close. The proprieter says they will probably not reopen. That is terrible, but isn’t that the way it always is? You find a place with good food, good prices and then they leave. Is the market closing as well? The truck at this location is open, but it’s no longer Davane. The name has been painted over. Can’t comment on the food yet, but will report back later. I noticed that, as well. I had tacos from this place last night, and while they were ok, they were not Davanne quality. The tacos were the same low price of $1.30, but were smaller, and had less onions. Also, they messed up my order by giving me chicken (which was just ok) instead of pork, so I can’t comment on the quality of their Al Pastor. Their chorizo tacos were pretty good, though. This is a new edition of this truck with a new owner so will see what the summer brings for this. Just ate here. I was hoping to eat at Davenne’s, but realized they were gone. I had verde enchiladas and a few tacos (asada and chorizo). This place is not good at all. They are trying to make their food taste like El Vaquero. 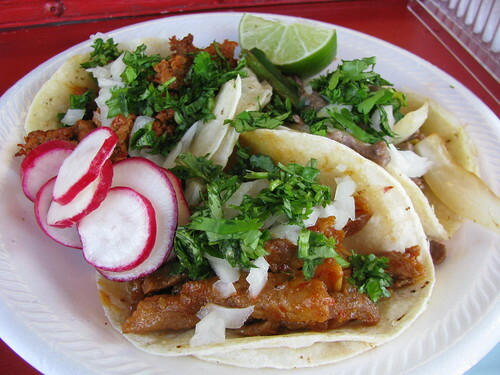 I go to taco trucks because I don’t want food that tastes like El Vaquero. I do not recommend, go to Juniors tacos across the street. RIP Davanne…We Will miss you! Ate here on 8/18/11, the gentleman working the truck said their name was now Taco Prima (or something like that). Sorry, I was in a hurry. This was my first taco truck visit and I love love loved the beef taco with goat cheese. The chicken quesadilla was not as flavorful, but still beat El Vaquero by a mile. I’ll be back! Perhaps this place just needed to work out the kinks, because it was a lot better on a second visit. No longer was chorizo an option—it looks like they’ve scaled back their meat choices to pollo, asada, al pastor, and cecina. I ordered 4 al pastor tacos, and they were quite good: good amounts of meat, onion, cilantro, lime, radish, and with an extra container of green salsa. I plan on coming back to this place when, as it happened this time, the lines at Juniors are prohibitively long. Yes, they are. Both Juniors and Los Primos (formerly Davanne) are open for lunch.